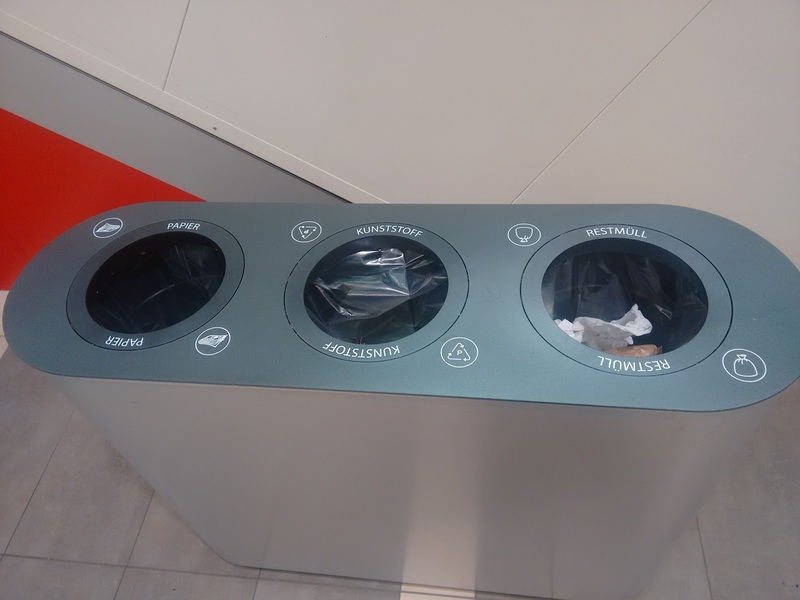 Non German-speakers, have you come across a trash can out in public and feel as if you need some sort of user manual to know that to toss where? Sometimes these trash cans are at least labeled in several different languages (usually in German, French, and English) but often they aren't. Sometimes there are graphics too, but they might not always make sense. Let's take a look at a trash can together, why don't we? So, meet Mr. Trash Can of the K in Lautern Mall. He has many cousins in the mall, too, and they're hungry for what you want to toss. Now that we've made his introduction, let's take a peek at his three hungry mouths, why don't we? Mouth #1, labeled Papier, is on the left. Can you guess what this is? Take out the "i" and you have "paper." Not too bad, eh? So, you'd throw paper in here, such as receipts, those flyers people hand you as you unsuccessfully try to dodge them during shopping, etc. Mouth #2, in the center, is for Kunstoff, which is plastic. It also might be labeled as Verpackung, which is packaging. This is where you can put empty containers. Mouth #3, on the right, is Restmüll, or garbage. It also might be labeled as Abfälle. In this Mr. Trash Can's case, you'd put whatever else doesn't belong in his other two mouths here. A mouth not pictured here is one for Glas (glass). There you have it! Before you throw something in, make sure that you pick the right mouth. You don't want to anger the rubbish gods nor those of the Germans who are just ready to get their Schimpf on. LOL For non-Germans, the Mülltrennung/garbage separation is a real challenge. My dad (from the US) has been staying with us, and in the first week I noticed he'd tossed an empty TP roll into the teeny garbage can we have in the bathroom next to the toilet. Now, most American women would be pleased as punch if a man in their lives would actually change the TP roll. And I was impressed. Except that, of course, the TP roll doesn't go into the garbage can - it goes into the Altpapier bin in the hallway. So I gently told him that. Not a big deal, but he's here for 4+ weeks. Since then, every time I went into his bedroom to open the window or the drapes to let in some sunlight, I found empty TP rolls on the floor! He couldn't remember where they went but knew not to throw them in the garbage, so he squirreled them away in his bedroom to figure out later! Poor guy... In the US this might be seen as the onset of dementia - in Germany it's just an American who can't figure out our trash system! Haha, that's cute that he had a secret stash of them. When we go to parties, no one ever knows where to put the recyclables. Sometimes the hosts say to just leave items on the counter. I do that myself because my trash and recycling is on my balcony. It is definitely admirable how good the recycling system here is!